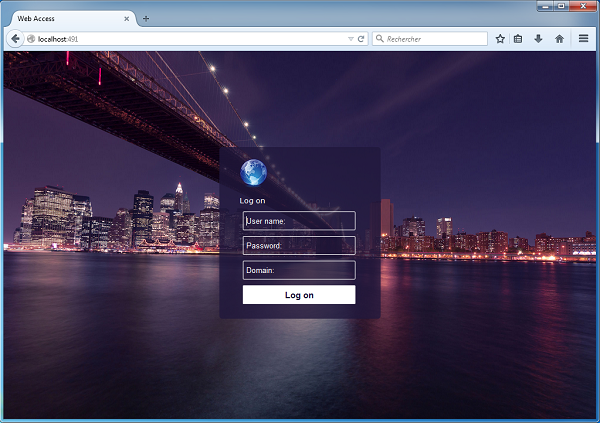 Remote Desktop Web Portal Based on HTML5 RDP client Just use Safari, Firefox or Chrome to start a RDS session. The perfect and costless alternative to ThinPrint. Remote Printing has never been so easy, You must try it! Your RDS servers are under threats. Prevent cyber-criminals to destroy your data. Secure users profiles. 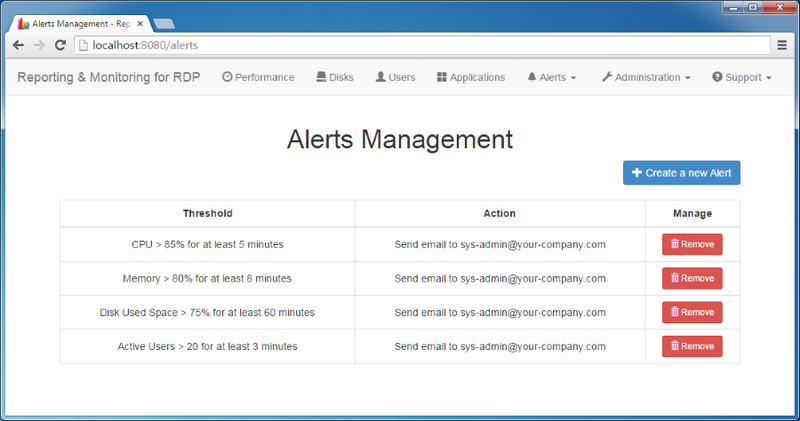 Monitor your RDS servers, create alarms and manage your users activity with graphical production reports. 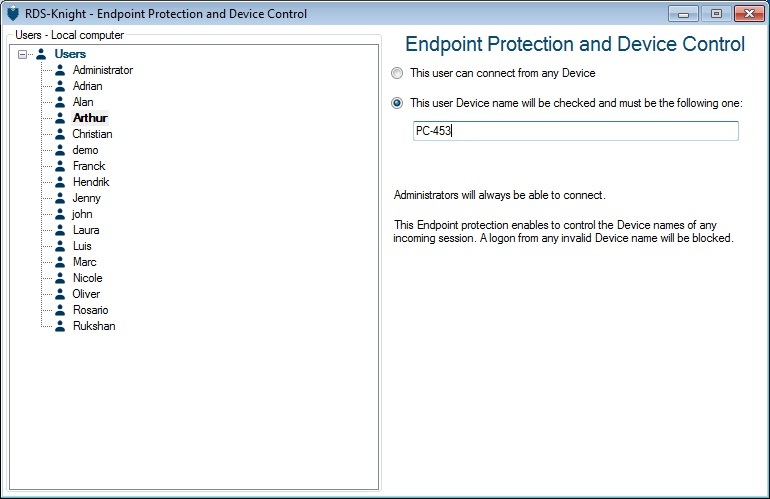 In today’s connected world, it becomes mandatory to access your Remote Desktop from any device (Laptop, Chromebook, IPAD, Macbook, Surface…). With RDS-WebAccess, you can run any Windows applications that simply don’t exist on any app store on your tablets.This is the most cost-effective and easy-to-use HTML5 solution to access your applications from everywhere and from any device. RDS-WebAccess allows you to access your PC or your RDS/TSE server to open your Desktop from anywhere in the world, using the device of your preference. Users will have a full Remote Desktop Experience by listening to the sound that plays on the remote machine in real-time, exchanging files between the remote machine and the portable device and even printing from the remote host to the local device. 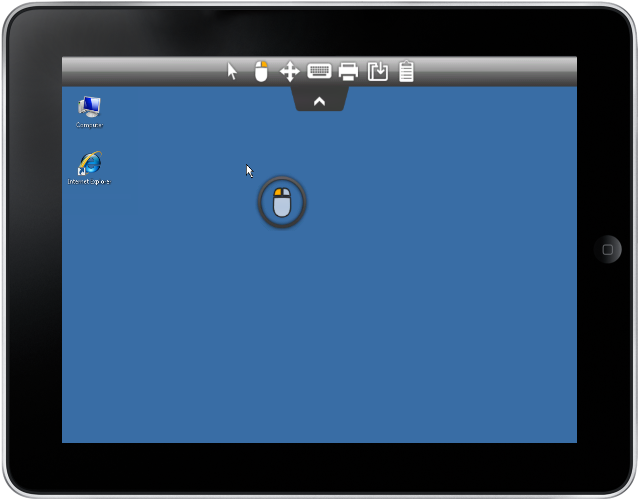 RDS-WebAccess is a clientless remote desktop solution. We call it clientless because no plugin or client software are required. RDS-WebAccess is a pure web solution and does not require Flash, Java, ActiveX, Silverlight or any other setup on the end-user side. Once this software is installed on your PC or RDS server, all you need to access your desktop is a web browser. The Web Access Portal provides secure, managed and accelerated access from local and any remote servers location, to text or graphics-rich Windows applications and to Windows desktops. You can easily customize it with different themes, various background images, your own images or logos… Access it securely thanks to SSL encryptions. Embrace BYOD – minimize IT hassles and help desk support load. Take advantage of RDS-WebAccess features and secure, anywhere, any device connectivity and access-management solutions. With RDS-WebAccess, you will leverage the advanced features of HTML5 to quickly and easily turn any HTML5-compatible browser or device into an enhanced RDP Client. Instantly connect to Windows desktops and applications, from iPad, iPhone, Android devices, computers running Windows, Mac OS X, Linux, Chrome OS, and even from locked-down work stations – without installing Flash, Java or any other software on the end-user device. That means zero client maintenance ! 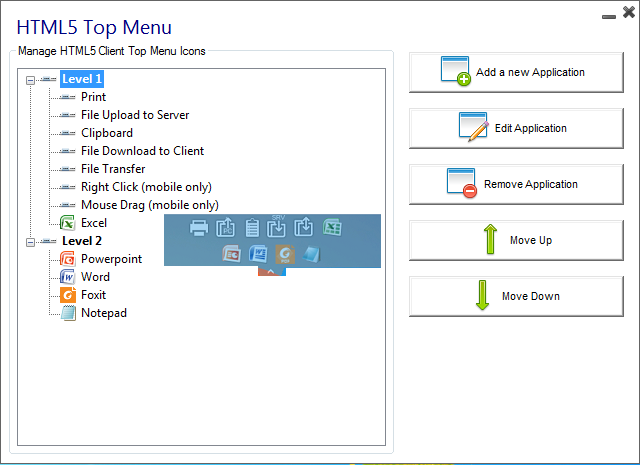 With RDS-WebAccess HTML5 top menu, add, edit or remove applications which will appear at the top of your webpage. 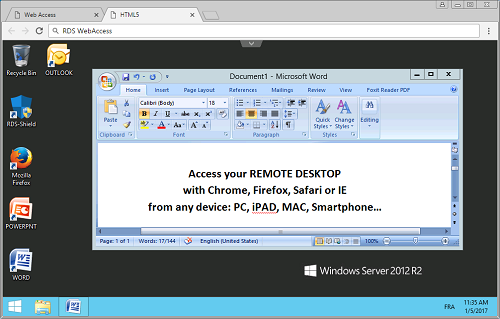 Easily share files from your Remote Desktop to the Server and vice-versa. Easily print from a remote location thanks to the Universal Printer. Remote printing doesn’t have to be hard, whether you want to print to a printer down the hall or half-way around the world. As you may know, printer redirection in remote desktop environment is full of restrictive technical pre-requisites. You will need to install the exact same version of device-driver on client and server side, which is not always easy because it is demanding. Also, USB Printing may not be supported at all. On a licensing level, the number of users and printers can also be restricted. RDS-Print increases your productivity by suppressing all these impediments. It is a driverless remote printing solution. 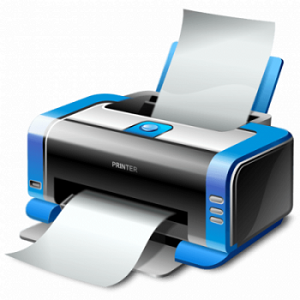 Print from your remote desktop session directly to your own printer(s). RDS-Print does not require any printer driver on the server. It will ease your remote printing experience and optimize it by reducing bandwidth usage. It just works out of the box, and allows your users to print on their local printers from any remote session. Compatible with all Windows versions from XP and 2003 to Windows 10 and Server 2016. With RDS-Print, you do not have to install printers drivers on the remote server. RDS-Print includes its own printer driver, which will receive the document to print, compress it and transfer it to the local printer of your choice. Our solution makes it easy to print, whether you’re in your office or across the world. 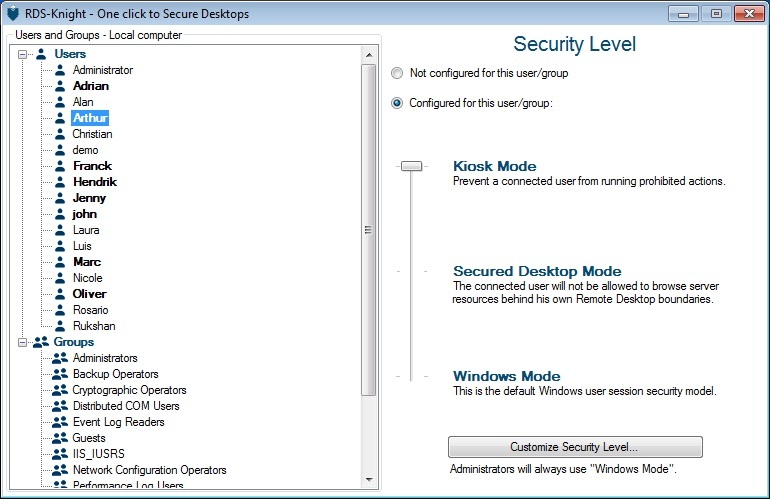 If your workstation has a remote desktop client, then it can use RDS-Print. You’ll quickly learn how easy and convenient it is to connect to your remote session and print directly to your local printer any type of file from anywhere in the world. You can also get a local preview of your document before printing, with any PDF reader, to make remote printing even more reliable! Simple implementation and ease-of-use, coupled with an affordable licensing system, makes RDS-Print the ultimate remote desktop printing solution on the market. 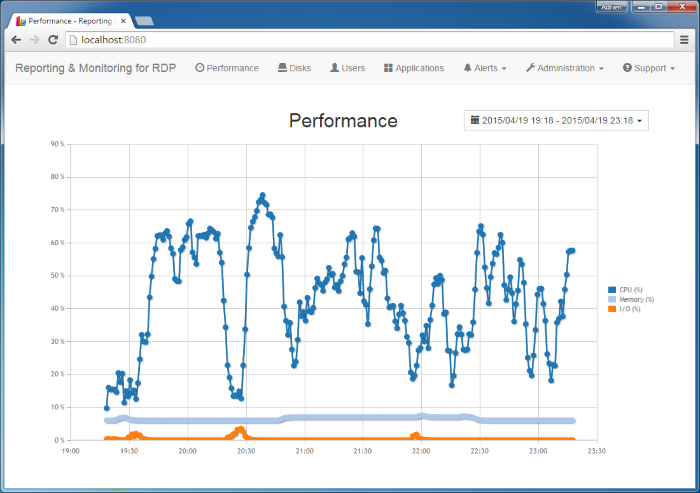 RDS-Print increases the stability of servers. Clients print directly to their local printers from the terminal server, without additional administrator time required for implementation or configuration. Plus, RDS-Print is available for an unlimited number of users and printers. To be used without any restrictions! Very quick to install and deploy. No complex network settings to tweak. No printers drivers to install on your servers. 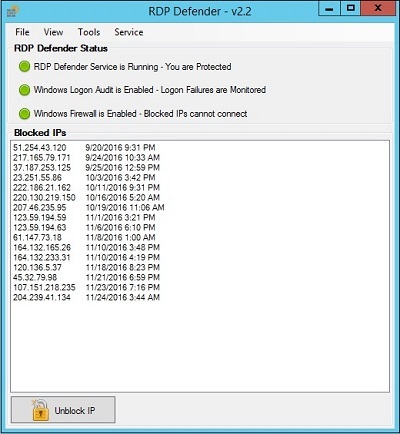 When it comes to exposing Remote Desktop Protocol to direct connections, you need a solid secure server to protect your systems against remote attackers. Due to the innovative techniques available for modern cyber-criminals and a use-after-free vulnerability in the Microsoft solution,hackers from all across the globe can easily access login credentials anywhere at all, carry out ransomware attacks and run arbitrary code on the targeted systems. Meanwhile, our team of qualified experts has worked hard to secure your remote desktop access. 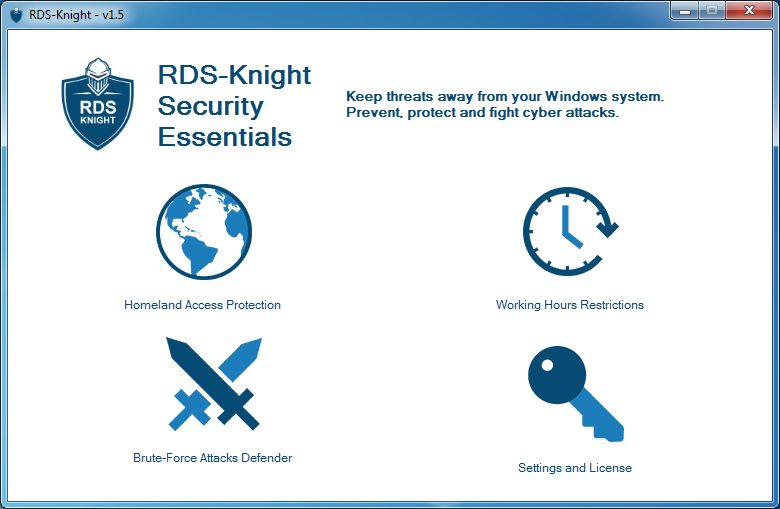 Born from the clear understanding of the problem,RDS-Knight offers advanced functionality and makes the use of remote access in your daily routine as safe as possible. 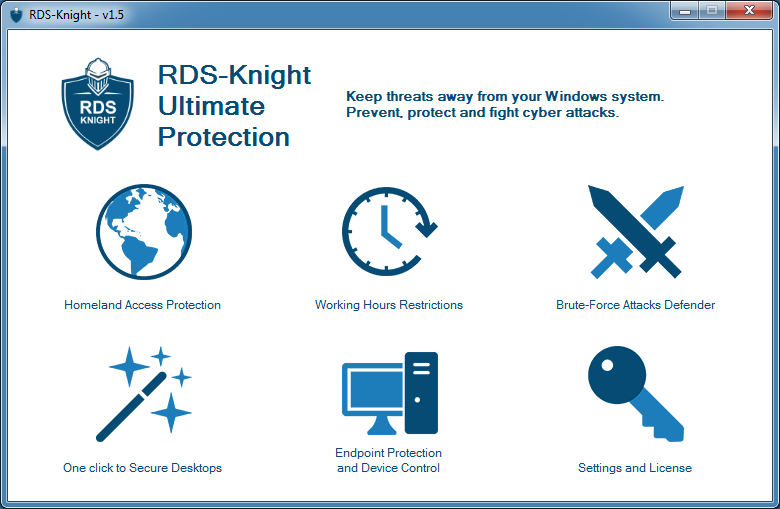 Now, with RDS-Knight you can easily manage the entire fleet of workstations even if you are a thousand miles away. With RDS-Knight, you can specify the working time of the day when each of your user or group are allowed to open sessions. Furthermore, you will be able to specify their time zone and that could be important for your office in UK! 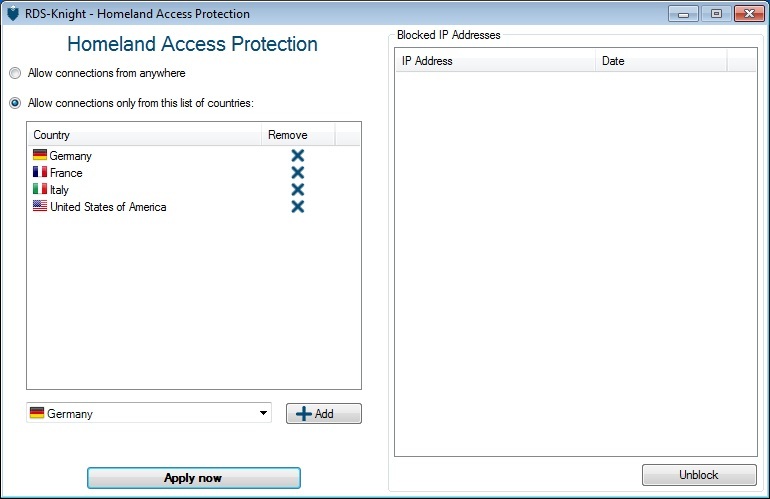 It will be so easy and amazingly nice to enhance your security policies. 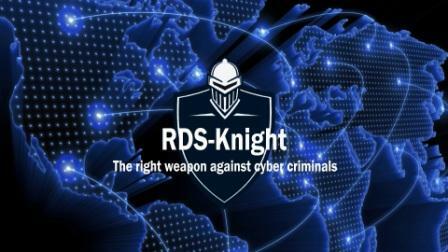 Stop the constant attacks right now with RDS-Knight brute-force attacks defender. It will instantly protect your server by monitoring Windows failed login attempts and automatically blacklist the offending IP addresses after several failures. Moreover, you can of course configure it to match your needs. Windows is providing many powerful GPOs but it will cost you several days to enforce the expected security rules. Most of us are not comfortable enough with such kind of system restriction policies; as result we give up on it or we select only few of them. Why a hacker could be able to use a stolen Windows credential to open a session from any device? This should be prevented. The EndPoint Protection is rhe right answer. It will bind the user’s credential to the user’s own device. Server Genius gives you facts and data about your server usage (CPU, Memory, I/O, Disks), applications usage an users on Remote Desktop Services. No long days required to setup complex reports. Get information about employee activities when they are connected to Remote Desktop Services. Use Server Genius to track monthly or daily activities, identify the most active hours, and monitor user activity by day. 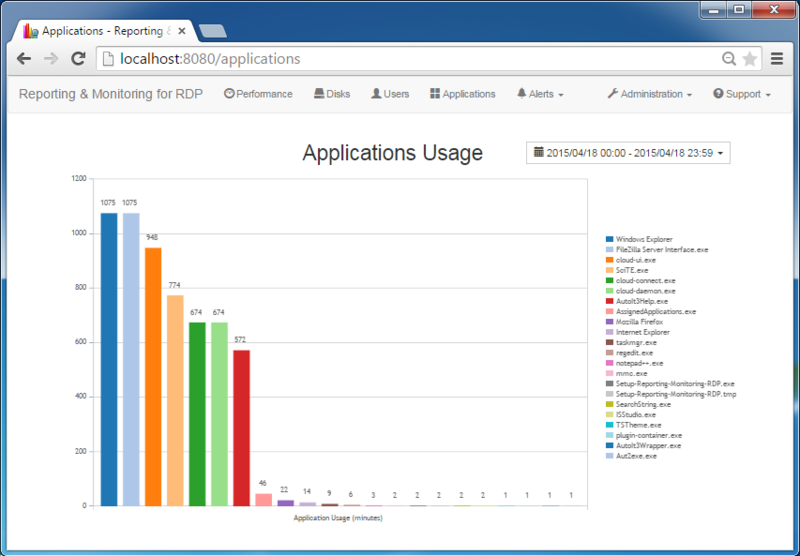 Get important audit information about applications and determine the most frequently used and the most appreciated apps on a RDP host server. Monitor the total time users spend using a particular app.